Product description: Soothe and heal skin naturally with what we think is nature's best skin healing ingredient, Calendula (kal' len' dula). Commonly known as Pot Marigold, this flower has been used to safely soothe and heal skin for centuries. California Baby's Calendula Shampoo & Bodywash uses an active percentage of this wonderful flower that we call Nature's First-Aid. 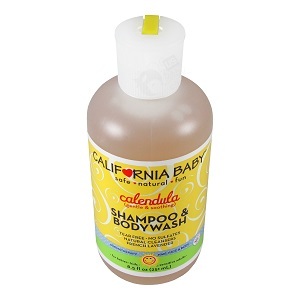 California Baby natural vegetable glucoside cleansers are sulfate free, non-stripping and extremely biodegradable, making washing a non-drying and effortless affair. 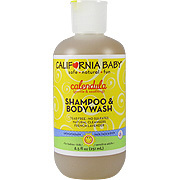 California Baby's light & fresh Calming essential oil blend adds to the bathing experience. Leaves hair noticeably shiny, soft, and manageable. For everyday use and is recommended for those with sensitive, irritated or extremely dry skin and helps to soothe dermatitis, eczema, and cradle cap because of its slightly astringent action. 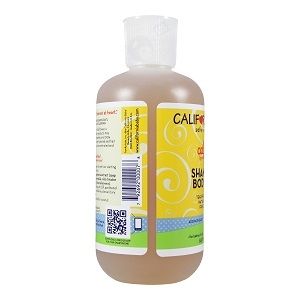 Calendula Shampoo & Body Wash - Sensitive or Extremely Dry Skin, 8.5 oz is shipped in a discrete, unmarked package. Orders are processed immediately and usually takes about 3 to 5 working days to be received. We do ask that you try it for 2 to 3 weeks to feel the full effects. Any information received is used only for order processing and shipping purposes. Your information, such as e-mail address, will never be disclosed to a third party.